You've thought about these locations for years; now's your chance to experience them -- or experience them anew, if this will be a return visit. Price: $1750 ($1799 after 1 June). 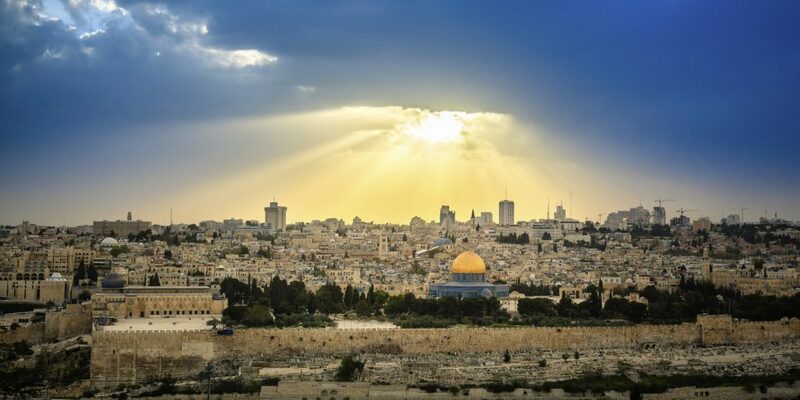 There is also an option to extend 3 days, in order to experience several sites we are unable to take in during the main (7-day) itinerary, including Bethlehem (Church of the Nativity), the Herodion, the Citadel (Towerof David), Yad Vashem (holocaust memorial), Burnt House Museum, Jerusalem Model, Shrine of the Book (Dead Sea Scrolls), Israel Museum, and Ashkelon (Philistine city) or another site. We will be staying in the Prima Royale Jerusalem for the first two nights, and the Leonardo Plaza in Ashdod for the final night. Price $840. (If you're in a single room, $1050.) This year (so far) 47 have registered for the post-tour. Get ahead of the game by signing up for this life-changing trip. Listed below are important items required and included in the trip. The 2016 BST (144 members). Shot taken on Mount of Olives, with Temple Mount in background. Total registered for 2018 BST: 1115 -- Australia, Brazil, Canada, Curaçao, Denmark, England, France, Germany, Ireland, New Zealand, Scotland, Sweden, Switzerland, the US, and Vietnam.